Each month the night sky holds many beautiful and interesting objects that we can observe if the weather gods allow. The focus of this article is on the second half of August and on objects that can be seen by the unaided eye. Instead of hunting exoplanets, we will look out for the brighter planets in our own solar system, stars, galaxies, and famous constellations. Venus, our inner neighbour towards the Sun, will pass Earth in the middle of August and end her phase as evening star. At the end of the month her elongation will be large enough to become visible once again as bright morning star just before sunrise. On the 26th, as it seems when looking from Earth, the Sun will have caught up with Jupiter and they will appear together in the sky making it completely impossible to observe the gas giant. Saturn ended his opposition loop earlier in August and he is also setting earlier each day: When he could be observed from twilight to 01:03 CEST at the start of the month, he will already set at 23:02 CEST at the end of August. Sunset and twilight happens earlier too, which helps hunting down Saturn soon after sunset. 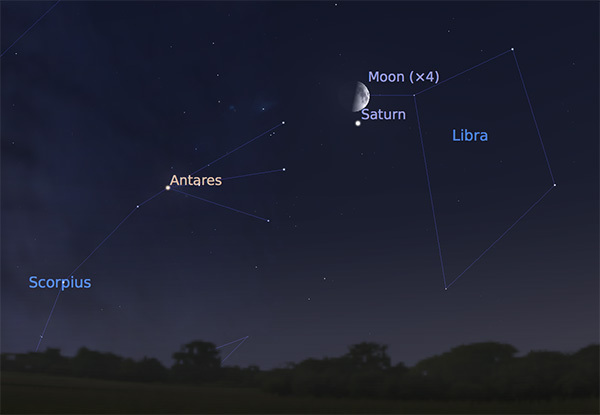 Especially beautiful will be Saturn’s meet-up with the Moon on the 22nd around 21:30 CEST: Deep down in the southwest, the waxing Moon and Saturn will be in very close conjunction. You can see Libra on the left, and Antares will shine in its bright reddish hue from the left in Scorpius. No other month lets us spot more shooting stars racing across the nightly skies than August. The main reason is the Perseid meteor shower that just peaked last week around the 13th. As many as 100 shootings stars per hour could be observed and some of them were several seconds long and looked like fireballs. The quite spectacular phenomenon is produced by small particles with typical sizes between a needle tip and a fingernail. They enter the Earth’s atmosphere at very high speeds, heat up, and start to glow before most of them eventually burn up. The air around them is glowing as well, that’s why we can see them so well despite their small size. The Perseids are a regular meteor shower that occurs whenever Earth enters the dust tail of comet Swift-Tuttle around August 12th each year. This comet crosses Earth’s orbit and leaves small particles behind in its path. It is still possible to see Perseids towards the end of August, but the frequency is much lower. Two more meteor showers will add shooting stars to the night sky near the end of the month: On the 27th, the Pi Eridanides and on the 30th the Gamma Doradides will have their maxima. At any given dark time, you should be able to spot at least one shooting star within 15 minutes. Have your wishes ready! The summer constellations are dominating the night sky and are high up towards zenith. As soon as the twilight starts, we can see Vega in the constellation of Lyra, Deneb in Cygnus, and Altair in Aquila. Together, these three bright stars are also called the summer triangle. In the west, a reddish star sparkles close to the horizon: Antares, the brightest star in Scorpius is about to set soon. Close to Beta Scorpii, the second brightest star in this constellation, you can see the sand-brown steady light of Saturn. Not far off due West is another red giant star: Arcturus in the constellation of Bootes. 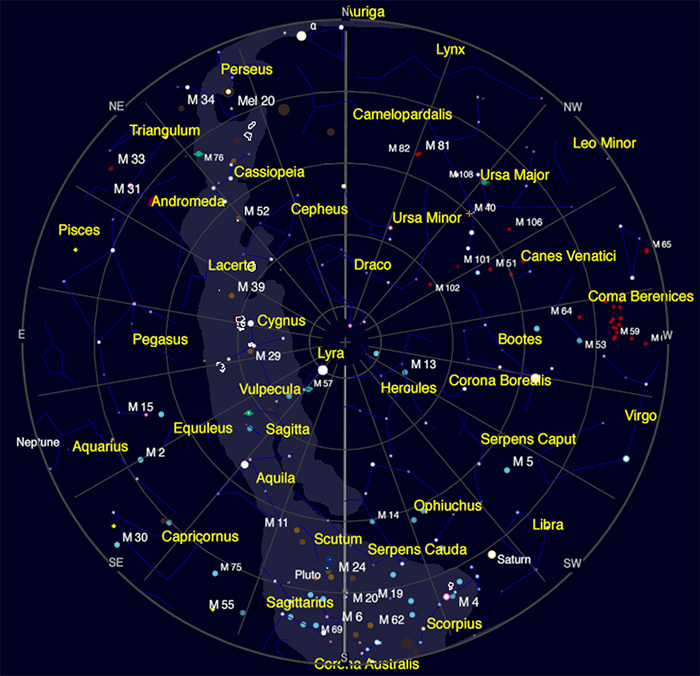 On its left side is a half circle of stars that catches the eye: The northern crown or Corona Borealis. In the East, the famous large square of Pegasus is rising. Attached to its left is the constellation of Andromeda. If you have good eyes and a dark location available, you might even spot the fuzzy light of our neighbour galaxy, M31 or the Andromeda galaxy.